My brother-in-law Tony and his now fiance Robbi asked me to do an engagement photo session last weekend. 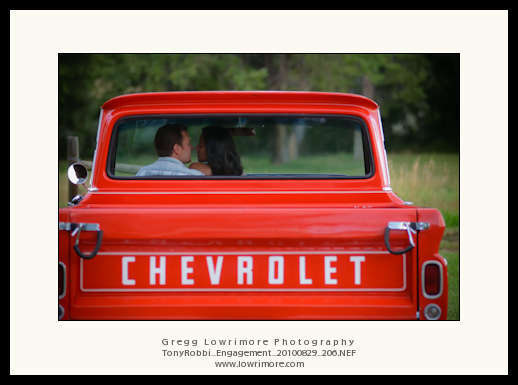 I’ve also been wanting to shoot his cherry vintage Chevy truck on a green grassy area for years, so we combined the ideas and came up with this. This is just a sample image from the 250+ I took that afternoon and yet one of my favorites. The happy couple were thrilled with the proofs I sent them and I’ll post more samples from this session when I can. Please post comments/critiques on this photo in the comment fields below. What could I have changed or what could I have done to improve this composition? Posted in Engagement, Portraits and tagged chevrolet, chevy, engagement, orange, Robbi, Tony, truck by greggl with no comments yet. Here’s another image from the Worldwide Photowalk back in July. I liked the simplicity of the composition, the busy bee on the flower and the clean background. Great soft lighting too! 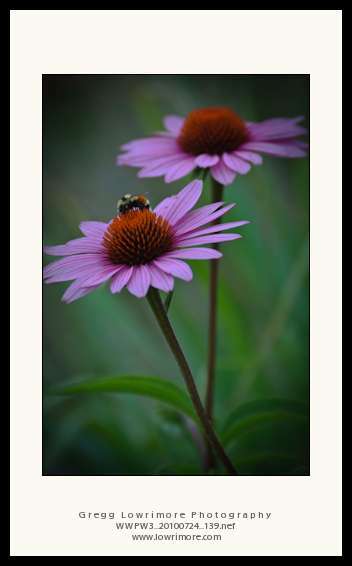 Posted in Fine Art and tagged bee, echinacea, Scott Kelby Worldwide Photowalk by greggl with no comments yet. Great iPhone Photography Applications – Part 2 « THE ADVENTURES OF A COMMERCIAL PHOTOGRAPHER / FILMMAKER. Posted in Latest News and tagged iPhone photo apps by greggl with no comments yet.